I have taken a brief look at the spectra in the database. Thank you so much, that is exactly what we hoped for. We now have to compare the optical spectra with the Chandra data, but we have not received the Chandra data yet (it typically takes 2-3 weeks after the observation - there is a delay of 1-2 days until the data is downloaded to Earth and then a few days to two weeks for processing at the Chandra data center). Christian Schneider (who is responsible for the Chandra observation) and I will update you in this thread once we know if there was any X-ray activity during the observation. There will be no more X-ray observations of T Tau in the forseeable future. This is already the second time that T Tau is observed in X-rays and observing time on X-ray telescopes is hard to get, because there are only two satellites in orbit that can do this type of observation (XMM-Newton and Chandra). Personally, I think that T Tau is a very interesting star (actually, it is a multiple system, but most components are deeply embedded behind strong absorption and are not visible in the optical), but I am not sure if we learn a lot when we keep looking in the optical. All classical T Tauri stars are strongly H alpha variable, so I expect things to happen with T Tau, too. Comparing Halpha with the X-ray data I knew that we were looking at something that nobody has ever done before for any massive T Tauri star. 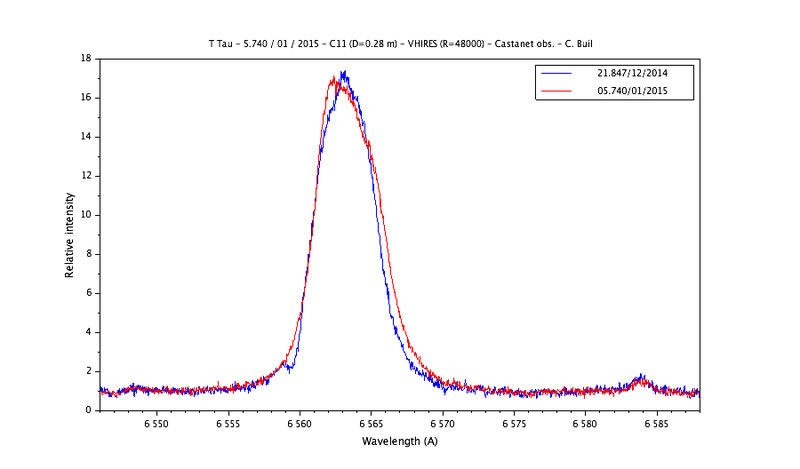 In my opinion it will be useful to keep looking at T Tau, but I cannot promise that we will find exciting new stuff. Thank you again so much for all the data you have taken so far! Christian Buil wrote: Other Chandra observations on this object are programmed? Do you think it is useful to intensively observe this star now? Do you encourage this initiative ? It appears correct? Can you help for analyze the (potentials) results? It is useful to intensify the campain now? I think such a campain would be very useful. However, the Chandra observations are over, so there is no immidiate need to do it "right now". I don't know very well where most of the you observers are located and at which time of the night you have most interest and time to do the observations. If you think that fall 2015 would be a better date because of the visibility, then you should consider that. Do I encourage it? Definitely. Can I help? I definitely will help with the analysis. Anything I can do to tease out more info about T Tauri stars! I received nothing - Could you try again ? Many thanks Hans for the infos and suggestions! I just wanted to share with you that we have now received the Chandra data. We thought it would be straigthforward to make a lightcurve to compare it with the H alpha equivalent width, but the data is better than we thought. T Tau N is actually a close binary itself separated be about 0.1 arcsec. The bright component contributes > 90% of the flux, and that's the star that almost certainly causes the H alpha emission. So we could just take the entire light observed and add that all up, but we try to do better! In this case, the photon probably hit the upper right corner of the middle pixel. In this way we can measure the position of a pixel more preceise than the size of a pixel. Obviously, there is software to help with this, but we want to be careful and do things right, so it might take a little longer until I can show you a good (and correct) X-ray lightcurve here. So this post is just to let you know that we are working on it, but have nothing to show yet. Did anything come out of this work does anyone know? Did anything come out of this work ? A fair question given that it takes so long. I need to apologize, but we are still working on it. In addition to the XMM-Newton observations, we also got data with the Chandra X-ray telescope. We decided to wait for that (the observation happened in 2015) so that we could compare the two X-ray observations with each other. Christian Schneider is working on that data and send me a draft of his article just today. We plan to have that ready in the next few weeks and I'll share a summary here when we have it. "TTauri" isn't "Ttauri" : thanks Paolo ! 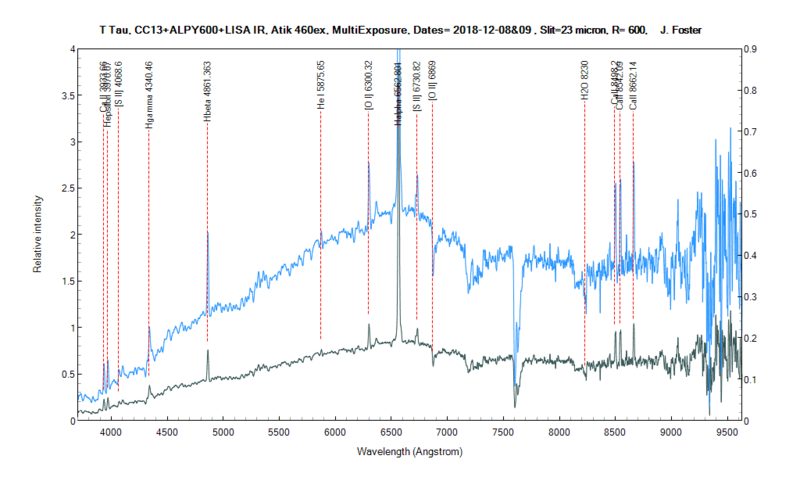 The link to these spectra in the ARAS database is broken and the button for T Tauri stars in the database here is not working. Where can I find these spectra? All identified lines are speculative, especially the SII lines shown.